Refrigeration is a critical component of any restaurant for a variety of reasons, not the least is the health and safety of its customers. Keeping a close eye on how that refrigeration is working is key to avoiding health concerns and potentially the loss of all the contents of a walk-in cooler. 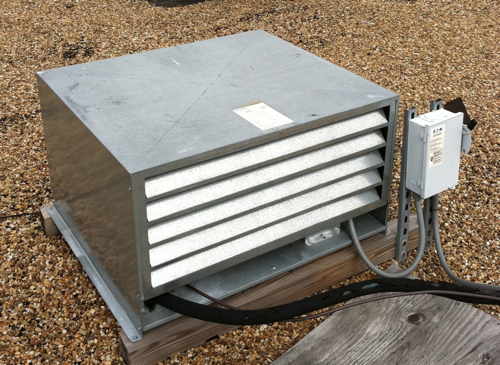 In this article you will see how easy it is to notice that a walk-in refrigeration condenser unit is beginning to malfunction. Most any kind of fault will disrupt the observable common pattern of how the condenser unit operates. Condenser faults may build up over time wasting energy and working equipment harder before a total failure occurs. There can be adequate time to get a faulty unit fixed before it completely fails if the behavior change caused by the fault is detected. Quick visual inspection of Virtjoule charts to compare patterns can easily identify changes in behavior that need to be investigated. We recently notified a customer of a behavior change that we observed in the walk-in refrigerator for their restaurant. This is a critical unit for the restaurant as it’s the condensing unit for the only walk-in refrigerator that they have at this site. As you will see in this article, it’s not hard to figure out that something had radically changed in the operation of this unit despite the fact that the temperature in the cooler hadn’t risen. It was just a matter of time before this unit would have failed causing a big problem for the restaurant owner and the manager. The walk-ins for this restaurant chain are made by Harford Duracool. Their labels don’t last in the sun and so I don’t have the exact model number for this condenser unit. The photo below is of the actual unit that failed. What I want you to note in the following graphic is just how easy it is to determine that the unit has broken out of it normal pattern. This could be done visually or by using the Virtjoule cycle counter which would have shown a radical drop in the number of full cycles that occurred. The green and red highlights are mine. You can see that just before 10:00 am on October 30, this unit stopped doing full cycles and ran continuously until about 4pm where it shut down for a few minutes and then started back up with an intense series of cycles only shutting down once every 5-6 hrs. Clearly this is much different than the cycles you see on the left hand side of the chart. The unit is working much more aggressively and constantly. The unit wasn’t fixed right away and luckily there was not a catastrophic failure that would have required moving or throwing away the food in the cooler. You can see this same failure pattern continued for quite some time. Finally, about 9am on November 11th, the unit was shut down. It was thawed out, condenser cleaned, and then restarted just after 10:30 am. It ran continuously for a while in order to catch up on its cooling, but then settled back into its normal cycle rhythm about 6pm. It has been running normally ever since. In conclusion, you can see that it’s not at all difficult to notice that there was a problem developing and it was also quite easy to see when the problem was resolved. Virtjoule didn’t diagnose what the problem was, but it gave enough warning time for the unit to be looked at, fixed, and restarted before a catastrophic failure occurred. There was no other type of monitoring being done on this unit and it would have completely failed leaving the cooler to warm up at an inopportune time (night, food inspector dropping by, etc.). Compared to that inconvenience, a call to the Harford Duracool dealer and service was all it took to get things working well again.